"But sir, you don't have a rope or a bucket," [the woman at Jacob's well] said, "and this well is very deep. 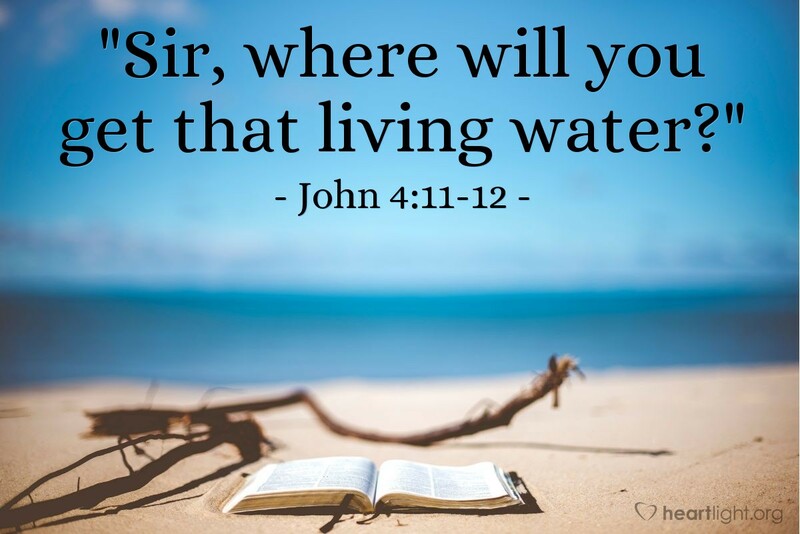 Where would you get this living water? And besides, do you think you're greater than our ancestor Jacob, who gave us this well? How can you offer better water than he and his sons and his animals enjoyed?" When life is not going well, when our dreams lie shattered at our feet, we long for someone who is bigger than our experience and larger than our hope to come and ransom us from our hopeless drudgery. "You can't get me water; you don't have a rope and bucket!" Behind the woman's skepticism is an inkling of hope. She's looking. She's longing. Hope hasn't been encased in desperation so long that it has died. Of course, we know who Jesus is; and we know the answer to her real question. Yes, the one you talk to, dear lady, is greater than your ancestor Jacob. Much greater. And he doesn't need a rope and bucket. In fact, he doesn't even need a well. You are about to have your flickering hope revived and your parched soul refreshed. Just keep seeking. Just keep asking. Living water is already starting to flow. O precious Father, I have several people on my heart today whose hope is nearly gone. They can't seem to find their way to Jesus. Please keep their flickering hope alive. Please use me to help them find Jesus to slake their thirsty souls. Use the people around them to keep them asking and looking and longing for something, for your Someone, to do what no one else can do for them. I pray this earnestly for those I love, in the name of Jesus. Amen.